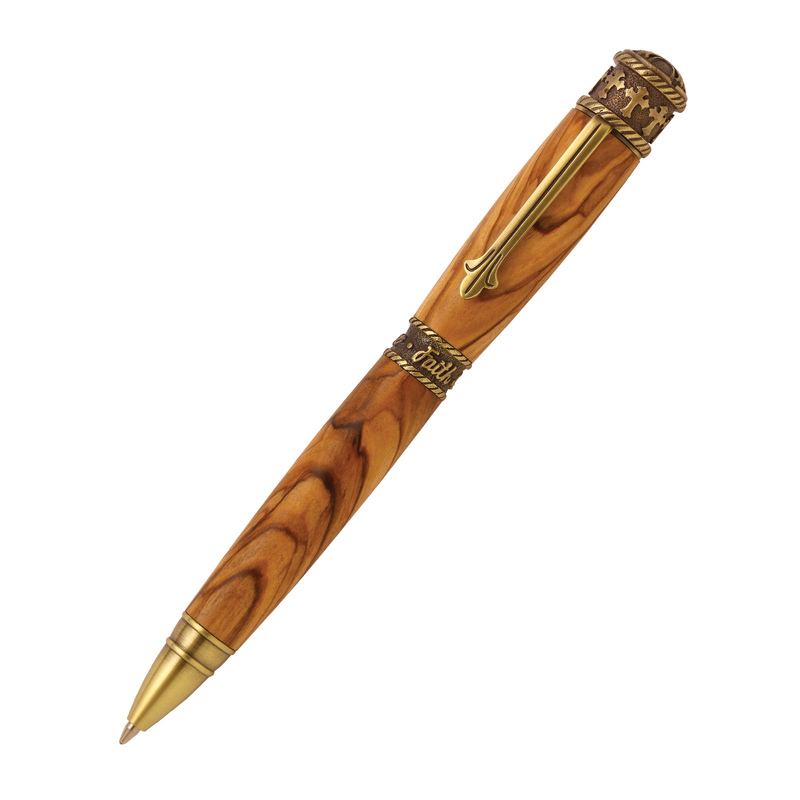 Faith Hope Love Antique Brass Twist Pen [PKHPENAB] - $53.00 : AnkleBiter Woodworks, When all else fails, send in the dacschund! "Faith" "Hope" and "Love" are intricately cast into the center band and the pen top features attractive cross designs. The Cross on the tips and clips are reference to the Fleur-de-lis. In the Middle Ages the symbols of lily and Fleur-de-lis overlapped considerably in Christian religious art. The three petals of the heraldic design reflect a widespread association with the Holy Trinity. Here we are using the three to symbolize the virtues of Faith, Hope and Love. The braided rope detail reinforces the concept of trinity, with a braided rope being made from three separate stands into something much stronger. Smooth writing performance with a Parker style refill. Plus, The rustic, authentic look of this antique brass will pair beautifully with any wood blank. We've taken quality brass plating and chemically darkened it to simulate aged brass, which results in a gorgeous, long lasting brown plating with golden undertones. This product was added to our catalog on Friday 26 June, 2015.